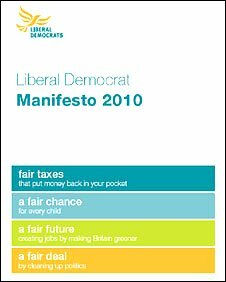 Fairness is the key strand running through the Lib Dem manifesto, which incorporates four main themes of fair taxes, more chances for children, a greener economy and cleaning up politics. Along with the much-touted pledge to scrap income tax on earnings up to £10,000, it features guarantees to protect the state pension and increase pay for service personnel. Measures aimed at cleaning up politics include limiting political donations to £10,000, giving people the power to sack errant MPs and introducing the single transferrable vote system. Through their manifesto, the Lib Dems attempt to position themselves as the party being honest on the economy by spelling out their estimates on tax and spending. 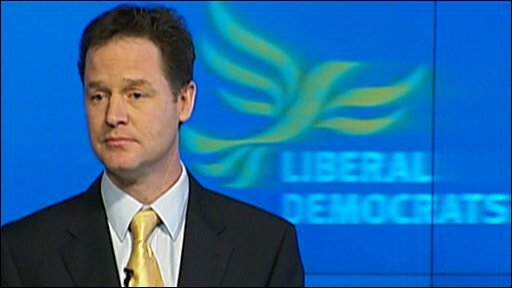 The Lib Dems keep their commitment to phasing out university tuition fees, albeit over a longer period. The Lib Dems see Labour's National Care Service as unaffordable but neither do they back the Tories' insurance proposals. On immigration, the Lib Dems adopt Labour's points-based system - but on a regional level - and dismiss the Conservatives' annual limits. Firm proposals to reform the way MPs are elected, without referendum. No commitment to preserve winter fuel payments in current form. Plans for the railways focus on re-opening local routes, rather than firm proposal of high-speed project.